# file-online-preview [! [GitHub license](https://img.shields.io/github/license/kekingcn/kkFileView.svg?style=flat-square)](https://github.com/kekingcn/kkFileView/blob/master/LICENSE) ### Introduction This kekingcn kkFileView project is intended to be a solution for previewing documents online. At present,there are some similar paid products in the industry. Such as 【[永中office](http://dcs.yozosoft.com/)】,【[office365](http://www.officeweb365.com/)】,【[idocv](https://www.idocv.com/)】, etc... It is an open source implementation and released under the Apache License version 2.0. Finally,It is aimed to feedback the community after obtaining the consent of company executives, special thanks to the supports of @唐老大 and the contributions of @端木详笑. ### Features - Build with the popular frame spring boot - Easy to build and deploy - Basically support online preview of mainstream office documents, such as Doc, docx, Excel, PDF, TXT, zip, rar, pictures, etc - REST API - Abstract file preview interface so that it is easy to extend more file extensions and develop this project on your own ### Live demo > Please treat public service kindly, or this would stop at any time. URL：http://file.keking.cn/ ### Documentation 1. 中文文档：https://gitee.com/kekingcn/file-online-preview/blob/master/README.md 1. 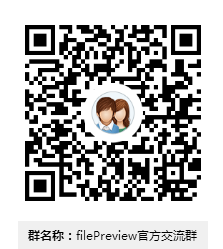 English document：https://github.com/kekingcn/kkFileView/blob/master/README.en.md ### Contact us && Join us > We will answer everyone's questions in use of this project. And please Google or Baidu first before asking a question, so that we can solve it efficiently. Cherish life away from ineffective communication. ! [输入图片说明](https://gitee.com/uploads/images/2017/1219/173717_934cb068_492218.png "屏幕截图.png") QQ group：613025121 ### Pictures for some samples > Excel ! [输入图片说明](https://gitee.com/uploads/images/2017/1213/093051_cd55b3ec_492218.png "屏幕截图.png") > doc ! [输入图片说明](https://gitee.com/uploads/images/2017/1213/092350_5b2ecbe5_492218.png "屏幕截图.png") > zip,rar ! [输入图片说明](https://gitee.com/uploads/images/2017/1213/093806_46cede06_492218.png "屏幕截图.png") > png,jpeg,jpg,etc., support for zooming with mouse scroll, rotation, inversion,etc. ! 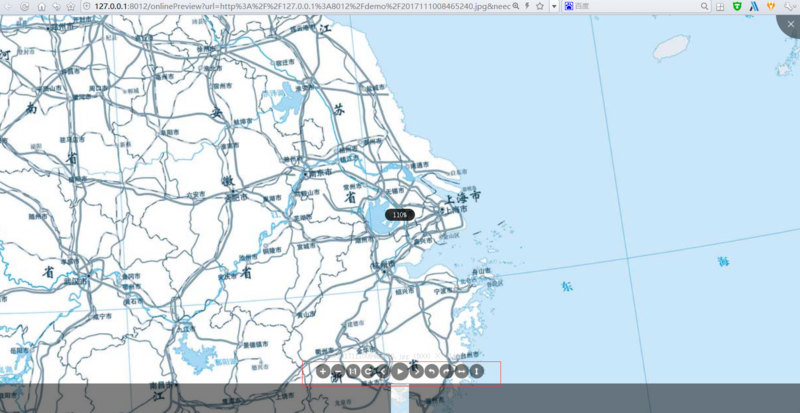 [输入图片说明](https://gitee.com/uploads/images/2017/1213/094335_657a6f60_492218.png "屏幕截图.png") Considering space issues, the pictures of other types of documents will not be shown here.You can deploy it by yourself if you are interested in our project.There is a way to deploy it as below. ### Quick Start > Technology stack - Spring boot： [spring boot Development Reference Guide](http://www.kailing.pub/PdfReader/web/viewer.html?file=springboot) - Freemarker - Redisson - Jodconverter > Dependencies - Redis(Optional, Unnecessary by default) - OpenOffice or LibreOffice 1. First step：`git pull https://github.com/kekingcn/file-online-preview.git` 2. Second step：configure redis address and OpenOffice directory，such as ``` ##The folder for files which are uploaded to the server(Because of running as jar) file.dir = C:\\Users\\yudian\\Desktop\\dev\\ ## openoffice configuration office.home = C:\\Program Files (x86)\\OpenOffice 4 ``` 'file.dir' is the real storage address of the converted files, please end with '/'. 3. Third step：Run the main method of FilePreviewApplication.java.After starting,visit `http://localhost:8012/`. If everything is ok,you will see the picture below. ! [输入图片说明](https://gitee.com/uploads/images/2017/1213/100221_ea15202e_492218.png "屏幕截图.png") ### Changelog > April 8th 2019 1. Cache and queue implementations abstract, providing JDK and REDIS implementations (REDIS becomes optional dependencies) 2. Provides zip and tar.gz packages, and provides a one-click startup script > January 17th 2018 1. Refined the project directory, abstract file preview interface, Easy to extend more file extensions and depoly this project on your own 1. Added English documentation (@幻幻Fate，@汝辉) contribution 1. Support for more image file extensions 1. Fixed the issue that image carousel in zip file will always start from the first > January 12th 2018 1. Support for multiple images preview 1. Support for images rotation preview in rar/zip > January 2nd 2018 1. Fixed gibberish issue when preview a txt document caused by the file encoding problem 1. Fixed the issue that some module dependencies can not be found 1. Add a spring boot profile, and support for Multi-environment configuration 1. Add `pdf.js` to preview the documents such as doc,etc.,support for generating doc headlines as pdf menu，support for mobile preview ### Register Usage If this project is helpful for you, please register on 'https://gitee.com/kekingcn/file-online-preview/issues/IGSBV', If this project helps you to economize the service charge for preview of documents, as well as you are willing to support us, click 【donate】 below to donate a cup of coffee, we would appreciate it. This kekingcn kkFileView project is intended to be a solution for previewing documents online. At present,there are some similar paid products in the industry. Such as 【永中office】,【office365】,【idocv】, etc... It is an open source implementation and released under the Apache License version 2.0. Finally,It is aimed to feedback the community after obtaining the consent of company executives, special thanks to the supports of @唐老大 and the contributions of @端木详笑. Please treat public service kindly, or this would stop at any time. We will answer everyone's questions in use of this project. And please Google or Baidu first before asking a question, so that we can solve it efficiently. Cherish life away from ineffective communication. png,jpeg,jpg,etc., support for zooming with mouse scroll, rotation, inversion,etc. Considering space issues, the pictures of other types of documents will not be shown here.You can deploy it by yourself if you are interested in our project.There is a way to deploy it as below. 'file.dir' is the real storage address of the converted files, please end with '/'. 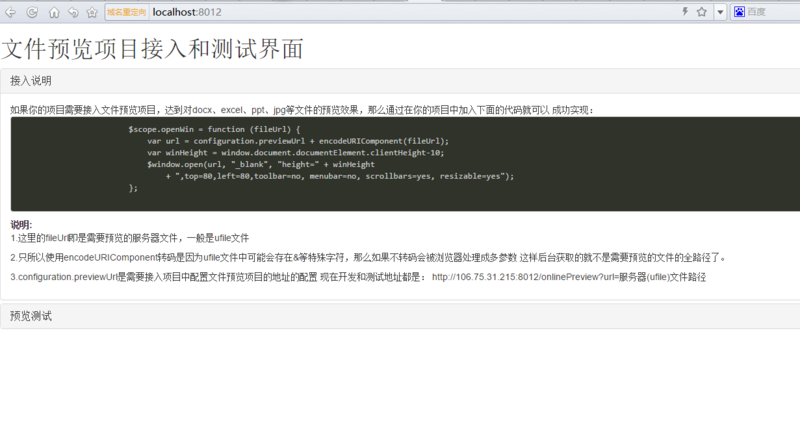 Third step：Run the main method of FilePreviewApplication.java.After starting,visit http://localhost:8012/. If everything is ok,you will see the picture below. If this project is helpful for you, please register on 'https://gitee.com/kekingcn/file-online-preview/issues/IGSBV', If this project helps you to economize the service charge for preview of documents, as well as you are willing to support us, click 【donate】 below to donate a cup of coffee, we would appreciate it.